Las Vegas … just thinking about my old home makes me nostalgic for the bright blue sky … the dusty desert … the palm trees. By day, Las Vegas is colorful, thanks to nature. But, by night, its an entirely different story. When the sun sinks behind Mt. Charleston, the lights come on. Every hotel’s marquees flash enticing messages. The Luxor spotlight shoots into the sky. Perhaps the best way to catch a glimpse of the city is from above. I am partial to landing at night and sitting on the right side of the plane where I am treated to a spectacular view of the entire valley. 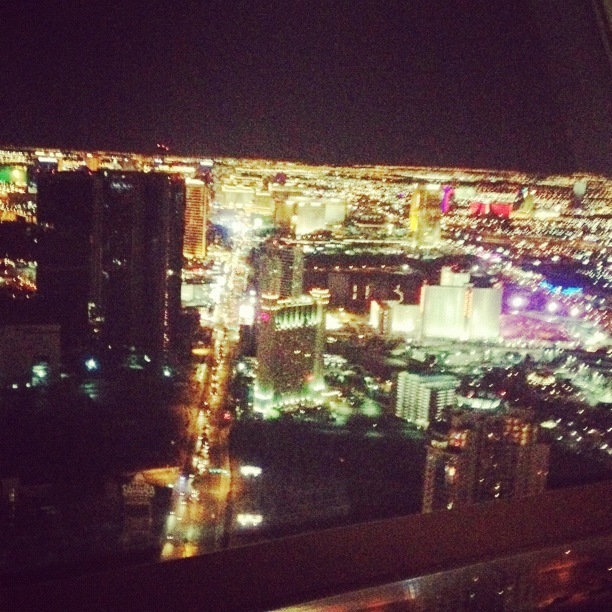 But, when not in the air, one of the best spots to see the city, particularly The Strip, is from The Top of the World restaurant. At a not-so-shabby 1,000 feet above Las Vegas Blvd. and rotating oh-so-slowly, the nighttime view from the restaurant is one for the books. So many pretty lights! I totally heart city skylines at night. I trust mimosas/mojitos/margaritas accompanied the taking of this image? Preferably all three. YES. Wine. Lots and lots of wine. Reminds me a lot of Tokyo at night, except oddly Vegas looks tame lol. Crazy how much it changes from day to night! Vegas’ skyline is just one big burst and that’s it. Unless you count Downtown, but it is so small. It does change so dramatically.